We can produce custom made zipper pulls by different type of materials and styles suitable for all types of garments and accessories to improve your fashion creations and raise brand awareness. We are producing woven zipper pulls which procure an economical and easy way of branding garments by attaching to an available unbranded metal puller. They are producing with a slit hole added for easy attachment. It is only difference than our woven damask labels. Designs can be single or double sided and can be flat or padded. 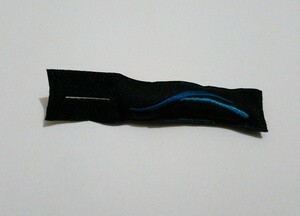 We can produce real and imitation leather zipper pulls which have a hot stamped, embossed or printed design. As with PVC zip pullers, they are mostly providing with a metal loop attachment onto a slider, but we also can provide with a hook and loop fastening or with a slit hole for looping on to an existing puller. We are producing PVC zipper pulls which are strong and soft branding item featuring full colour designs which are either embossed, debossed or printed. Generally, they are provided with a metal loop for attachment to a zip slider, but we can also provide with a hook and loop fastening for looping on to an existing puller.